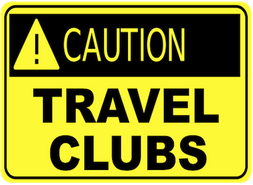 Avoid The Travel Club Trap! Getting rid of your timeshare should be a simple process, don’t let it get complicated by enrolling in a travel club. If you are fed up with the timeshare industry, high pressure presentations and high travel prices then you should avoid both travel clubs and timeshares. Getting wrapped up in a travel club can be an unpleasant experience just like timeshare ownership. What is sold to you as a convenient, money-saving way to travel is usually far more complex and frustrating than just booking your own travel arrangements. Travel clubs dictate where and when you can travel just like timeshare ownership. Getting rid of your timeshare shouldn’t mean getting roped into another commitment. Choose Timeshare Redemption and get your freedom back! No More Travel Programs, Just Timeshare Freedom! 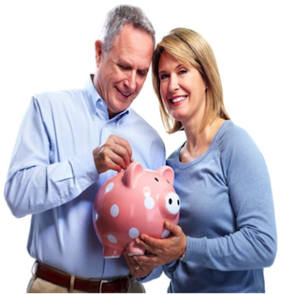 Put Money Back In Your Pocket – THOUSANDS of Dollars Less Than The Competition. Quick, Easy, Legal and Permanent Transfer of Ownership. Call us Today at 888-743-9051 To Get Timeshare Free For Less! 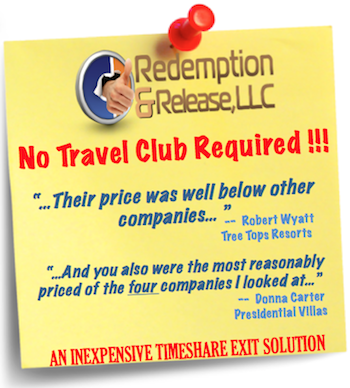 Discover Why Redemption and Release, LLC is the Nations Premiere Timeshare Redemption Office! Everything was just as promised and right on time. The staff was always friendly, patient and helpful. Collectively, the experience was far better than expected. We feel great about being rid of this timeshare. Great job! 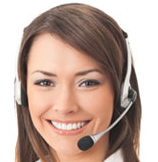 From the beginning, they have been thorough, efficient, friendly and professional. To be honest, it was very disappointing to realize that I would have to pay to unload my Newport, RI timeshare. Yet, the process was solid. Thank you and halleluja! They (the resort) provided no value to the consumer with their convoluted reservation practices. I had the mortgage paid off out of fear and decided not to pay their membership fees for the reason that they make it highly difficult to get out of the membership...I’m happy I’ll never have to talk to them again! Your personnel helped alleviate the stress involved and your record helped develop trust. It has been a relief to deal with a company that did what it said it would do to transfer our timeshare title at a cost below others. Thank you for your caring and polite service. Your service was excellent. The price was worth it, you walked me through every step, and very friendly through the whole process. Thank you so much for helping me to acquire my freedom.